As natural language processing spans many different disciplines, it is sometimes difficult to understand the contributions and the challenges that each of them presents. 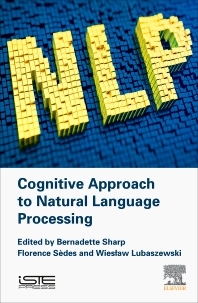 This book explores the special relationship between natural language processing and cognitive science, and the contribution of computer science to these two fields. It is based on the recent research papers submitted at the international workshops of Natural Language and Cognitive Science (NLPCS) which was launched in 2004 in an effort to bring together natural language researchers, computer scientists, and cognitive and linguistic scientists to collaborate together and advance research in natural language processing. The chapters cover areas related to language understanding, language generation, word association, word sense disambiguation, word predictability, text production and authorship attribution. This book will be relevant to students and researchers interested in the interdisciplinary nature of language processing. Processing and Constructions: the Basis of the “Interpret Whenever Possible” Principle. 2. Can the Human Association Norm Evaluate Machine-Made Association Lists? 3. How a Word of a Text Selects the Related Words in a Human Association Network. 4. The Reverse Association Task. 6. Transductive Learning Games for Word Sense Disambiguation. 7. Use Your Mind and Learn to Write: The Problem of Producing Coherent Text. 8. Stylistic Features Based on Sequential Rule Mining for Authorship Attribution. 9. A Parallel, Cognition-oriented Fundamental Frequency Estimation Algorithm. 10. Benchmarking n-grams, Topic Models and Recurrent Neural Networks by Cloze Completions, EEGs and Eye Movements. Bernadette Sharp is Professor of Applied Artificial Intelligence (AI) at Staffordshire University, UK. Her research interests include AI, natural language processing, and text mining. She has been Chair and Editor of the International Workshop for Natural Language Processing and Cognitive Science since 2004. Wiesław Lubaszewski is Professor at the Department of Computational Linguistics of the Jagiellonian University and Professor at the Computer Science Department of AGH, University of Technology, in Kraków, Poland. His research interests include natural language dictionaries, text understanding, knowledge representation, and information extraction.